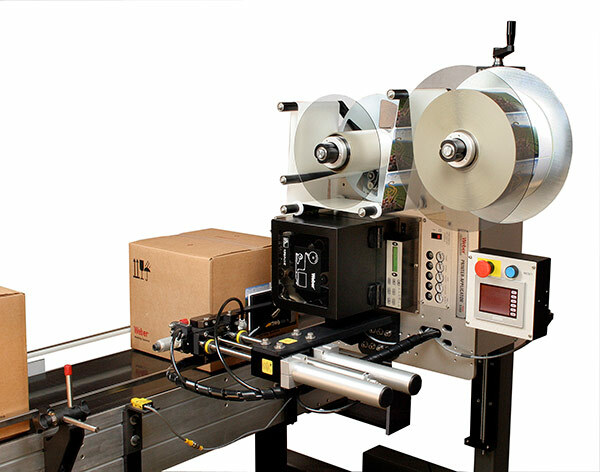 Weber's Model 5300 Twin-Tamp label printer-applicator combines a high-performance thermal/thermal-transfer label printer with a specially configured applicator to satisfy the printing and two-label, adjacent-panel application of carton labels in line. Many large company now require identification labeling on two or more sides of a carton. With the 5300 Twin-Tamp, you can label two adjacent sides of a carton on one quick step. If you need to label all four sides, just add another 5300 twin-tamp down the line to label every panel in less than 12 feet. Designed, engineered and built exclusively by Weber, the Twin-Tamp system is available with a choice of print engines, including 203-, 300- or 600-dpi units from manufacturers like Zebra, SATO and Datamax. Label sizes range from 2.0" wide and 1.0" long to 4.0" wide and 6.0" long. Each system can produce variable-sized text, bar codes and graphic images at speeds programmable up to 16 ips. After a label is printed, it is automatically peeled from its liner and retained by vacuum on a non-contact, tamp-blow applicator pad. The tamp pad is mounted on a 90-degree rotary swing arm that reaches across a conveyor and blows the label to the front panel of the moving carton. Upon its return, a second label is printed and a separate straight-line stroke applies that label to the side of the carton to complete the cycle. Depending on label size, the system can maintain up to 40 cycles per minute at a placement accuracy of ±0.03". 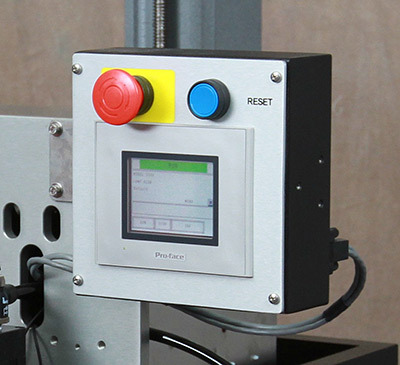 The system also can be configured to label side and rear panels, or single panels. And it easily adjusts to various conveyor heights and carton sizes when mounted on a heavy-duty stand. The Model 5300 twin-tamp system includes a number of noteworthy features that add to the operational versatility of this printer-applicator. • Tamp-blow application. This is a very popular method of air-assisted label placement used with standard applications, and is particularly useful in the labeling of recessed areas. A printed label is fed onto a tamp pad and held by vacuum, a pneumatic cylinder extends to within .25 inch of the product, and the label is blown onto its surface to a placement accuracy of 0.03". • Browser-based monitoring. The status of all operational functions and configurations can be monitored by logging on to a web page that is unique to each Model 5300 unit. • Numerous I/O's. The system can be interfaced with many types of external devices. • One-to-one media consumption. Special label unwind and rewind dimensions are matched to the system's ribbon supply to ensure they are consumed at the same rate, reducing downtime and eliminating partial changeovers. • Print job storage. Multiple label printing formats can be stored in the system's memory, making it easier for an operator to select a job directly from the applicator instead of downloading a computer file. The Model 5300 twin-tamp system boasts numerous additional features as well, including an upgradeable microprocessor controller, various inputs/outputs, plus durable construction that will withstand harsh industrial environments. There also are several optional enhancements that can increase the system's functionality. A product height sensor, for example, enables the printer-applicator to label items of varying heights delivered by the same conveyor. Other options include a 15-foot umbilical connection that enables the remote location of the unit's controller; an adjustable stand for optimum system orientation; label-on-pad and product-presence sensors; plus beacon light alerts to signal the status of label and ribbon supplies. 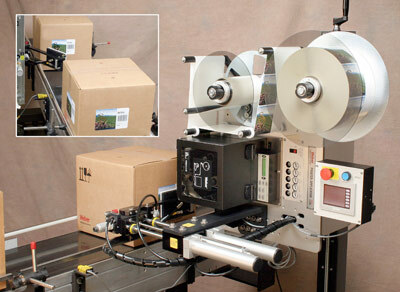 Which label printer applicator works best for your packaging?